Does a spoonful of ooey-gooey, creamy mac & cheese have your stomach rumbling? This favorite American dish can be found in upscale establishments and quick-bite eateries, but we’ve selected the best from around the state. Dive into a large bowl of cozy mac & cheese for a heart-warming meal anytime. Here are the 10 best places to get mac and cheese in Connecticut. Home Restaurant is a winner of numerous awards due to their tasty specialty mac & cheese. Choose among four mac & cheese options including Greek mac, spicy Buffalo chicken, lobster fra diavolo, and pulled pork mac. All of the above options come in full and half sizes, which is perfect if you aren’t super hungry or would like to try out one of their other tasty menu items. These Guy’s Brewery has transformed a former industrial building in downtown Norwich into a hip spot for drinks and delectable foods. Their Buffalo chicken mac & cheese and mac & cheese with bacon are both delicious and certainly hearty. Their beer selection is also on-point and is perfect to wash down the creamy mac & cheese. For a seasonal summertime treat, grab a seat along the water at Ford’s Lobster and enjoy a bowl of lobster mac & cheese. Locally known for the fresh from the water dishes and creative flavor combinations, Ford’s lobster mac is really good. Dine on delectable mac & cheese in the comfortable, relaxed the Corner Pug. 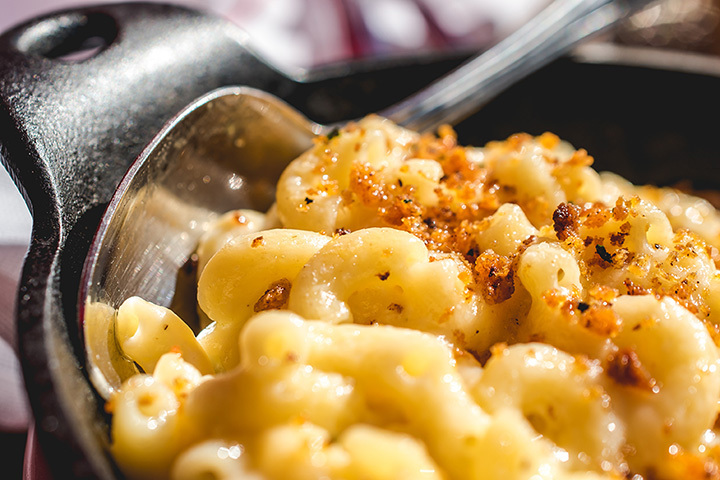 Their award-winning mac & cheese incorporates ziti, cheddar, Swiss, and gruyere and is topped with a helping of the oh so important crumbs. If you aren’t a fan of mac & cheese, don’t worry as The Corner Pug has a wide variety of other savory dishes. Paul’s Pasta is an amazing spot for fresh pasta in southeastern Connecticut along the shoreline. In addition to amazing alfredo, lasagna, and ravioli, Paul’s Pasta also has a really flavorful buffalo mac n’ cheese. This dish has a nice bit of heat, a perfect crumb topping, and comes in two sizes for diners of all appetites. This lovely eatery has a flavorful menu with two options for mac & cheese: Macdaddy and Sriracha chicken and bacon mac. These two delicious options are packed with flavor and a bit of spice. Expect a very filling meal when you order either of these two stick-to-your-ribs meals. Killer B is a raved about relatively new spot in Connecticut that has a wide array of burgers, milkshakes, and mac & cheese dishes on offer. At Killer B, expect over the top mac options such as Some Like It Hot, Bacon Burger Mac Plate, and the massive Lazy Man Lobster Mac with three pounds of lobster. That certainly is something special! Featuring local, seasonal, and organic produce, Good News Café has a great menu with a wide variety of options—including the comforting mac & cheese. The mac & cheese on the menu here is lobster mac with spinach provolone cheese and white truffle oil—yum. Their lobster mac is a menu favorite, so do stop by to savor a portion! Flipside offers up four different mac n’ cheese options on their jam-packed menu. The unique top your mac & cheese allows diners to choose a wide array of toppings such as chicken tenders, pulled pork, bacon, and more. Other options include plain mac, lobster and mushroom mac, and chili mac. Mac N’ Out is a picky-eater’s dream as it is packed with a marvelous macaroni menu. Deliciously cheesy options include bacon mac bites, pizza mac, French onion mac, chili mac and more. As the name suggests, Mac N’ Out serves a menu bursting full of creative and quirky mac & cheese options with everything from appetizers to salads and entrees.